A new version of our creator tool for Mac is now live! 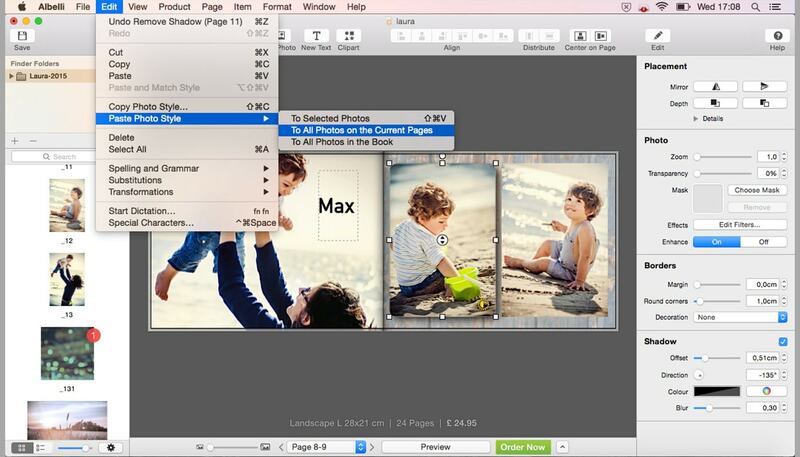 With version 3.1 it’s even easier to create your photo book. Read here what’s new and improved. Now when you give a photo a certain style, you can apply it to other photos as well using our newly added options ‘Copy Photo Style…’ and ‘Paste Photo Style’ in the menu bar. You can select the style attributes you want to copy from the selected photo, like transparency, photo effects and border decorations.The style gets copied to the style clipboard. When pasting the style, choose to paste it to selected photos, to all photos on the current pages or to all photos in the book. In version 3.1 it’s now possible to evenly distribute items on a page. You can find the option in the toolbar and use it whenever you want the spaces between selected items to be horizontally or vertically equal. It was already possible to vertically or horizontally center selected items on a page via the menu bar. To make that option more visible it’s now also added to the toolbar. In the previous version the ‘layouts’ option was only visible in the menu bar. In this new version it’s also visible in the toolbar. When you click the ‘layouts’- button you can choose from different layouts to apply to the page(s).